As the rain poured on Saratoga, the crowd took cover and the horses walked the paddock in anticipation. After a 41 minute rain delay, the field of eight were finally able to break from the gates in the $1.2 Million Whitney Stakes (G1). For 1 1/8th miles, the 5 year old gelding by Bellamy Road, DIVERSIFY, went gate to wire in 1:49.62 under the guidance of jockey Irad Ortiz Jr. While the rest of the field was covered in mud, Diversify cleanly crossed the finish line securing his Breeders' Cup Classic entry with this "Win and You're In" event. As he entered the winner's circle, the skies cleared leaving a beautiful rainbow in the distance. Trainer Rick Violette said they had planned on being aggressive, but with a :23.22 quarter and a :46.50 half, Diversify was cruising across the sloppy, but sealed track. MIND YOUR BISCUITS, a grade 1 winner, running two turns for the first time attempted a brave run home, but was unsuccessful in catching his rival. Mind Your Biscuits' trainer, Chad Summers admitted that it was a long shot for his horse to beat Diversify, but was hoping that he would be a little tired, but ultimately Mind Your Biscuits was just too far behind to make up the distance, especially with a face full of slop. Whether or not we'll see Diversify in the Breeders' Cup Classic is still undetermined. He won a "Win and You're In" event last year, but his connections chose to pass. If they do pass this year as well, they may be eyeing Dubai. The final finish for the $1.2 million Whitney Stakes was Diversify, Mind Your Biscuits in second and DISCREET LOVER in third. 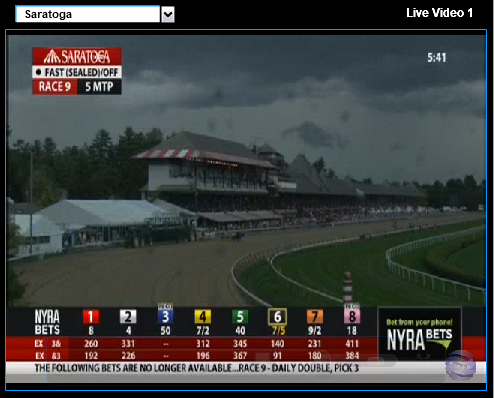 Saratoga ended up canceling the final two stakes races of the day due to the weather and track condition. MIA MISCHIEF started out of the gates quick and clean, taking the lead in the $500,000 Longines Test Saturday at Saratoga. At the top of the stretch, SEPARATIONOFPOWERS made her move on the outside and it was a tooth and nail battle with Mia Mischief down the homestretch. The pair battled down to the wire with Separationofpowers beating Mia Mischief by a neck. It was a photo finish for third between KELLY'S HUMOR and ALTER MOON, with Kelly's Humor taking third by a nose. Trainer Chad Brown was very happy with the filly Separationofpowers, who showed a lot of heart and tenacity in the thrilling finish with jockey Jose Ortiz aboard. "I thought Jose rode such an outstanding race, from start to finish. They're a good combination, those two." Mia Mischief's trainer, Steve Asmussen, said he was also proud of his filly's first Grade I start, despite wishing the outcome had been different. A field of eleven took to the turf in the $200,000 Yellow Ribbon Handicap Saturday evening at Del Mar with SASSY LITTLE LILA setting the pace. CAMBODIA settled in 5th on the outside, three lengths off the leaders Sassy Little Lila and ANCIENT SECRET. At the half, Cambodia moved into third with Sassy Little Lila still kicking on, but it was Cambodia who took the lead and at the top of the lane separating from the pack for a 2 1/2 length win. The daughter of WAR FRONT, Cambodia has shown her affinity for the Del Mar turf. The mare, owned by Winter Quarter Farm, has won three of her four graded stakes at Del Mar. She had a particularly rough start in the 2018 season, but back at Del Mar, she was the 8-5 favorite in the race. Owner and breeder Don Robinson was very happy with the bay mare, noting "This is her spot and she loves it." Cambodia won her first graded win in 2017 at the Gallorette Stakes (G3T) at Pimlico. She won last year's Yellow Ribbon by three-quarters of a length. We hope everyone had an enjoyable weekend of racing and remember that we have tips every day of the week in addition to all of the big Stakes races on the weekends. Have a great week!